CityTalk | Bogotá is cleaning its air one bus at a time. And it works. Bogotá is cleaning its air one bus at a time. And it works. Bogotà has one of the poorest air qualities of Latin America, largely ascribable to the transport sector. After launching a bus rapid transit system, the city has reportedly reduced its emissions by 350,000 tonnes each year. Adopting a Plan for Climate Change, Bogotà has chosen the path of sustainability and farsightedness. Change is silent in the high plateau where the city of Bogota, Colombia’s capital, rises from the savannah. Though one of the best performing Latin American capitals for the low CO2 emissions and its share of urban green, according to the Green City Index it also has one of the poorest air qualities of the continent. Much of the air pollution is generated by its 5 millions commuters who, lacking tramways or a metro network, largely move by car, taxi or loud diesel buses. To tackle this problem the city of Bogotà launched back in 2000 its first bus rapid transit (BRT) system, TransMilenio. Now one out of nine buses are part of the BRT network, which is helping to considerably reduce greenhouse gas emissions and air pollution. Bogotá’s BRT network is believed to have reduced CO2 by some 350,000 tonnes each year. It was the first major transport scheme in the world to earn Kyoto carbon credits. “Some people think that fighting climate change and protecting the environment are secondary issues, but it is not so” said Gustavo Francisco Petro Urrego, mayor of Bogotà “Air and water are the basis for life and we have a duty to preserve them”. But Bogotà wants to do more. The plan is to replace thousands of buses with low-emissions vehicles by the end of the year. Two hundred hybrid feeder buses are being produced and will be running within the next months. As taxi cabs have the largest CO2 emissions per passenger in the city, a pilot project was launched in 2013 to gradually convert the taxi cabs to electricity, which would not only reduce operating costs by more than 80% reducing consumption of fuel, but would also cut greenhouse gas emissions by more than 70%. The pilot project E-Taxis now consists in 50 taxi cabs, with the potential to grow. For these innovative and ambitious projects, Bogotà received the City Climate Leadership Award 2013, organized by C40 and Siemens, in the Urban Transportation category. 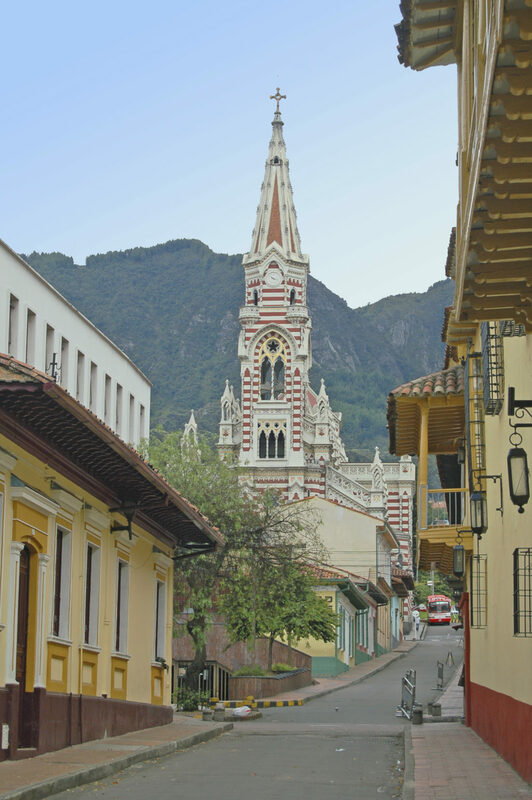 With its 6,8 million inhabitants, Bogotá is among the 30 largest cities of the world. It is also the third-highest capital city in South America, boasting a unique environment with the largest moorland of the world in nearby Sumapaz, also a national park as big as the city itself. Unfortunately, the city has to deal with several natural hazards: floods and landslides are very common during strong rainfall, which will be less exceptional as climate change will likely reduce dry months from 3 to just 2. The vulnerability to landslides is especially high in informal urban settlements, built on landslide prone hillsides. As the population grow, so does disorganized urbanization. With the intention to address these issues, the municipality of Bogotà has approved a Plan for Climate Change (Plan Distrital de Cambio Climático). The intention is to confront negatives effects of climate change, increase the capacity of communities and institutions and emphasize the necessity to conserve ecosystems. Bogotá envisions itself in 2038 as a green territory with organized water resources and solidarity with its region, allowing the city to adapt to and mitigate the impacts of climate change. The Plan includes 7 programs and 31 projects in the area of climate change and water management. Some of the projects include: improvement of water quality of the affluents of Bogotà river; transition bands between the city and the surrounding rural areas; urban planning for adaptation and mitigation of the impacts of climate change. In order to monitor its real situation and future progress, the city has also arranged a Greenhouse Gas Inventory. Bogotà is a longstanding Member of ICLEI and a new member of the EcoMobility Alliance. It also reports to the carbonn Climate Registry. See its profile on the Registry.